Love fabrics inspired by the Civil War era? Save every scrap? Best-selling author Carol Hopkins applauds you—she saves every scrap too! You’ll find fantastic ways to use your reproduction stash and scraps in Carol’s latest book, Civil War Legacies IV. 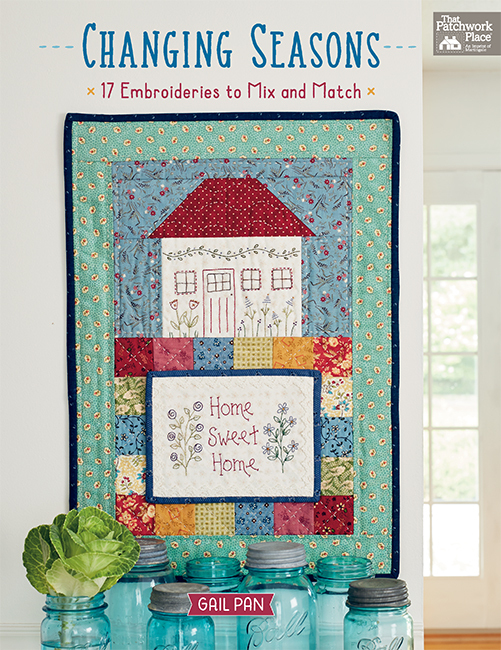 In this fourth book from Carol’s “Civil War Legacies” series, you’ll find a collection of small, spectacular quilts where every scrap you save can shine. 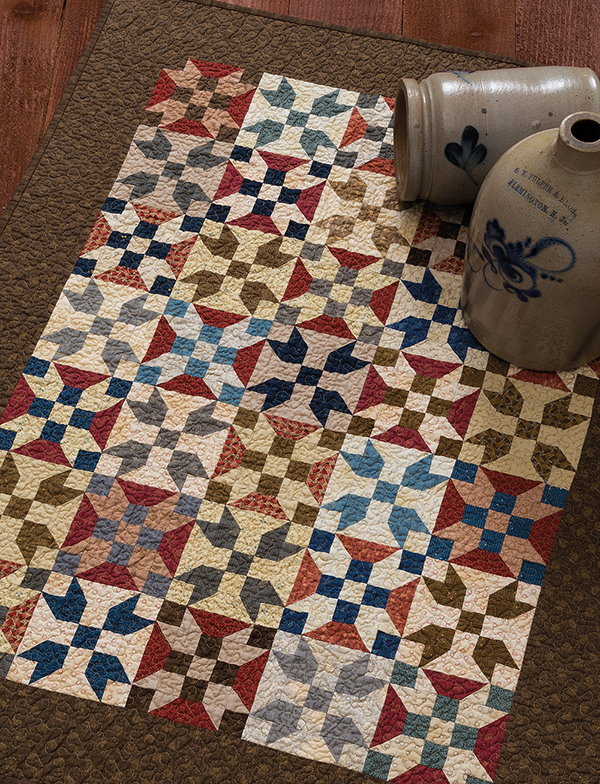 Along with 14 of Carol’s exquisite designs, you’ll enjoy reading little-known facts about the Civil War and Carol’s stories about how each stunning little quilt came to be. We asked Carol to answer a few pressing questions we had about her quilting life—read her answers below! Stitch This! : This is the fourth book in your best-selling “Civil War Legacies” series—what inspired book #1? Carol: I’d been designing about six new patterns a year to introduce to shop owners at spring Quilt Markets. I’d never thought about writing a book, but during my fifth trip to Market, I was approached by several publishers, one of whom was Karen Soltys representing Martingale/That Patchwork Place. I have bookshelves full of That Patchwork Place books that I’ve collected over my 30 years of quilting, and I was so humbled and excited about the possibility of having my own book with that logo in the corner. It was my own “yes to the dress” moment! ST! : What’s your typical process for designing quilts, and where do you find inspiration? 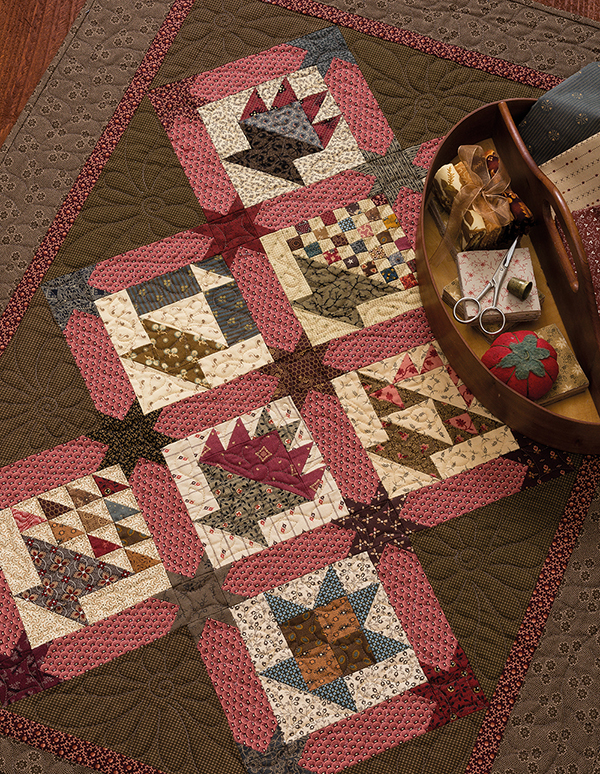 Carol: To be honest, I never design a quilt from start to finish before I start sewing. I’m always on the lookout for interesting blocks or settings in antique quilts. When I find an unusual block or a clever use of fabrics in a traditional block, I’ll make up one block as a reference. Then, when I’m ready to start a new quilt, I’ll make a few more, still with no plan for where I’m going. I seem to have a 10-block attention span, so when I’ve made about that many, I start to think about how I’ll set them together and how many more blocks that would take. This is probably the main reason that I make small quilts—once I’ve figured out a small one, I’m ready to move on. I often think I’d like to remake my small quilts into full-sized quilts containing more of those cute little blocks, but that just doesn’t seem to happen. ST! : It’s obvious that you have a love of reproduction fabrics; what is it that draws you to them over other fabrics? Carol: Reproduction fabrics call to me for several reasons. One is the soft, muted colors that reflect the worn-and-loved patina of those found in antique quilts. I’m also drawn to the motifs and details in the prints themselves, especially the beautiful florals and paisleys which may contain 20 or more different colors. When I first started quilting in 1980, there were no fabrics like these in the marketplace, so it was virtually impossible to reproduce an antique quilt. Turquoise polyester just didn’t do the job! When manufacturers started reproducing eighteenth- and nineteenth-century prints in the late 1980s, I could finally make quilts like those found in old trunks, and I’ve been focused on them ever since. ST! : You must have many, MANY little quilts—how do you use them? Do you display them all, rotate them out? How do you like to display them? Carol: My favorite display is a two-foot-tall folk art angel with jointed arms that can hold a quilt without folding it. I also have two small wooden rocking chairs once used by my husband and his twin sister, the backs of which are perfect for showcasing quilts. Other little quilts are displayed on doll beds, folded up in piles in glass-front bookcases, rolled in baskets, or used as table toppers. I used to have groupings of quilts hanging on the walls, but when we went all fixer-upper and removed walls, those spaces disappeared. With more than 100 small quilts, there’s no way I can display them all at once, so some spend their time in storage bins, waiting for their turn to shine. ST! : What do you love about being a quilter? 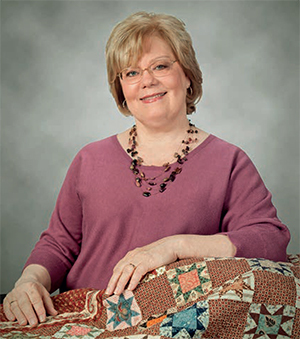 Carol: In addition to the creative outlet that quilting itself provides, and the never-ending new offerings of fabrics, patterns, and techniques, it’s the friendships with and inspirations from other quilters that nourish my quilting soul. I’m challenged to think of another group of people with such diverse talents and interests who come together to share, listen, support, and encourage others more than the heartfelt way that quilters do. ST! : Finish these sentences for us! One reason making smaller quilts is so fun is: They allow you to explore something new without huge time investments, and then you get to move on to a new project with a different selection of fabrics. If I had a three-word quilting mantra, it would be: Enjoy the process! My best tip for new quiltmakers is: Find your ¼". Before I begin a quilt, I must have: A scavenger hunt through my house to make sure I’ve found just the right fabrics from my stash. This goes with my other three-word quilting mantra: It’s here somewhere! If I had a quilting superpower, it would be: To surround myself with an anti-procrastination shield. Thanks for indulging us, Carol—congratulations on your lovely new book! Reading this post in email? Click here to watch the video. Some thinning—I’ve amassed a lot. A few more colors and prints—I need to go shopping. A kick start—I don’t have any yet! We’ll choose a random winner one week from today and let you know by email if you win. 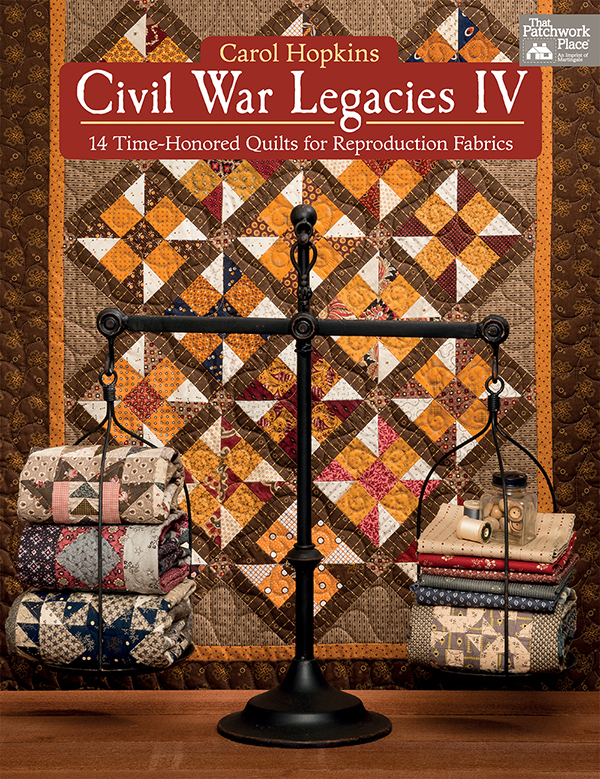 And if you’re ready to start sewing with Carol’s new book now, order Civil War Legacies IV at ShopMartingale.com and you can instantly download the eBook for free. We’ll email you about your prize, Susan—congratulations! Another inspiring book from Carol! My Civil War stash both needs thinning and a bit of enhancement. Thanks for the chance at your giveaway. A few more colors; I need to go shopping! 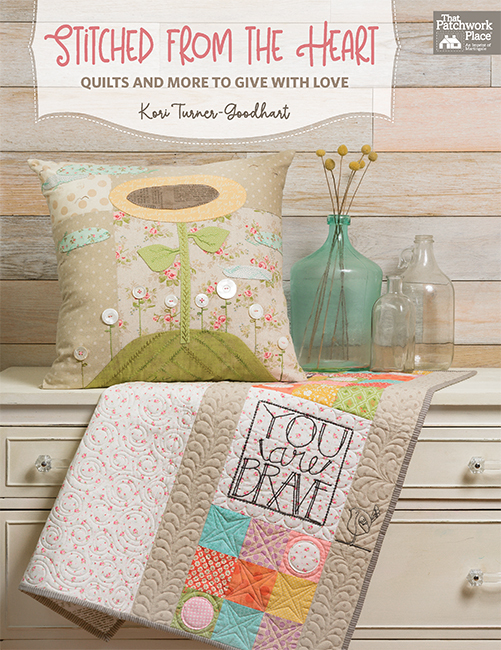 Love your work ~ your quilts are gorgeous. I need a kick start! I’ve always wanted to make a quilt from that era. I love the prints and patterns. A few more colors: I need to go shopping. I love your quilts ~ your work is beautiful. I need a lot more colors and prints. I need to go shopping because I have just started by Civil War fabric stash. Oh, mine definitely needs to be thinned. Over the last year I have been collecting Civil War fabrics and this would be the perfect book to use some of them. The patterns are really interesting and the color choices beautiful……might just have to buy a few more Civil War fabrics! I have a considerable sized stash……but…..I always need more, more, more! I need to go shopping!! A kick start – I don’t have any yet but I think I have found a new obsession! Love these little quilts. I need a kick start. I love civil war fabric but I don’t have nearly enough. A kick start I don’t have any yet. I need more variety so I guess I need to go shopping. Absolutely love the fabrics in her quilts! I’ve been making the table topper sized quilts and I adore them, I’m definitely going to enjoy Carol’s book, love her ideas on creating new blocks. She certainly has a great way to keep me motivated with my quilting habit!! I’m a little short on the stash for Civil War fabrics but intend to catch up soon! I need a kick start! I love Civil War fabric but have a hard time finding any where I live. Ordering on line isn’t the same as seeing them in their true color. I’d say I need a few more colors and prints, as you can never have too many, but hubby and kids would say it needs some thinning LOL! I need a kick start—I don’t have any yet. I have a quilt fabric shop near me that has a huge area of Civil War Reproduction fabrics and I love looking through them, but I’ve never bought any. I’d love this book to get that kick start I need. Thanks! I have some civil war fabric but need more. It is time to go shopping. I don’t have a "lot", but I do have some stashes that are specifically set aside for Civil War quilts that I’m just dying to use. Winning this book would sure be the jump start I need t do that! Thanks for the chance. I need to go shopping! The Civil War fabrics I have were purchased for particular projects, so I don’t have nearly a big enough selection to make Carol’s little quilts. Love what I see about this book! I have only been quilting for 3 years and I definitely need more reproduction fabrics. I just started collecting and sewing with them in the past year. The shops around here only seem to carry the more modern contemporary fabrics, which are pretty, but just don’t appeal to my tastes. I love reproduction quilts and have set a goal of making one of each of the classic patterns. So far I have done a basket quilt, a lone star, a 3″ tumbler, a house quilt and have in progress a bow tie quilt and a 2″ tumbler. I love the Civil War fabrics and quilt designs! Definitely need to shop for more fabric! A kick start–I don’t have any yet! But WOW, I think I need to start collecting them soon! Some thinning—I’ve amassed a lot. I have quite a few scraps and it would be a Happy time to put these precious scraps into a quilt. My stash needs thinning in certain colors (browns and blues), but I need to go shopping for more greens and purples – somehow they find their way into just about every Civil War quilt I make and there just aren’t that many new fabrics out there. I am loving the muted teals that designers are showcasing lately. Like Carol Hopkins I love the soft colors and the "old" look of reproductions. So cozy! My biggest problem is that I can’t sew quickly enough so my stash is always in need of thinning! I love your quilts and now I need to go shopping. The blue and gray is my favorite. There’s no such thing as too much repro fabric. I’m ready to go shopping! More colors, more prints to choose from…bring it on! I’m just starting out wuth civil war quilting and am loving it. Love looking for vintage style prints! My Civil War Stash needs "a kick start – I haven’t started one yet. My Civil War fabric stash needs organizing. Either I get all sorted and put in totes of civil war fabrics on one shelf or get started on making more little quilts. I have all the other Civil War Legacies books and enjoy making several. I definitely need a kick start. I don’t have any reproduction fabrics and have not found many stores that carry this theme. I will not give up on my search and winning this book would certainly start things off right. civil war reproduction fabrics are my favorites and I definitely need more. I’m sure some who have seen my stash would disagree, but I need to go shopping! I have some civil war fabrics. But I need way more for my stash. It is my favorite reproduction time period. MY Civil War fabrics are abundant. I need this book to make a lot of quilts! It looks wonderful. Thank you for a chance to win a copy. Love Carols quilts and books too! I’m a bit addicted to these small quilts- like Caol, I have a 10 block attention span. A few more colors and prints. Although I live in Russia, I adore the Civil War quilts. And I have one, I quilted it with the book of your publishing house. I will be happy to win another one! I have a fair amount of stash, but I can always use more!! Carol is sew amazing how she makes her quilts come alive with tradition and grace from those that came before us. Thanks again for a beautiful book sew time to go shopping. I have used some of my reproduction fabric but my stash doesn’t seem to go down! This looks like a fantastic book, thanks for the opportunity to win a copy! My stash needs thinning, but I’m sure I’ll end up shopping for one or two more fabrics. It needs to be thinned. Lots more colors and prints. I have done a few Civil War quilts, but would love to do more. I love the tiny prints and colors of that era. I have one of the books and I would love to have another one. I am so fascinated with the material and the colors. I really love the smaller quilts. When my niece and nephews have baby girls not only do a make a quilt for the baby but have started making doll quilts to match. My stash definitely needs a kick start. I only have a handful of reproduction fabrics because I don’t usually do traditional quilting. That being said I love traditional quilts and I like to decorate in a primitive style. I think it would also be fun to make something in this book because the project is small and wouldn’t take to long to make. I’ve amassed a lot of Civil War fabrics (and scraps now!!). Aren’t the combinations wonderful? You can just swirl them around and they speak another language. I had never really thought about Civil War- type fabrics until I saw a quilt made by my ‘guru’ quilting friend. Absolutely loved the brown/beige combinations. And no, haven’t got any fabrics yet, but would love to start on one of the(easier)quilts. You can never have too many Civil War fabrics. I have lots of fabric and scraps-just not Civil War reproduction prints-so I need to go shopping! Such a lovely book! My stash definitely needs a kick start in reproductions. I like Carol’s choices in fabric and her use of them. I really need to go shopping for more reproduction prints! 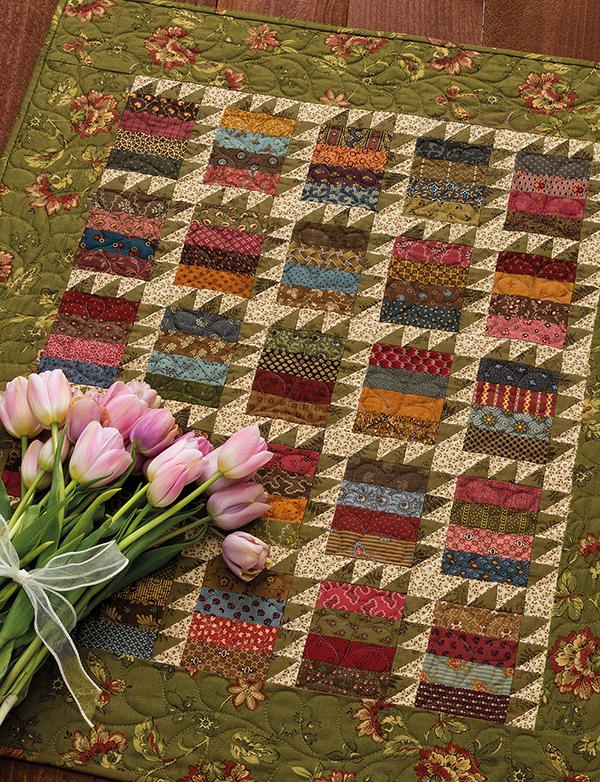 Especially the pinks & cheddars–they can really make a quilt pop. Quilts made from reproduction prints have an instant "comfy" look that I love! A kick start, I don’t have any yet. I have a few CW prints – I definitely need more! Carol’s New book to make a companion quilt to go with an 1860″s quilt from my grandparents farmhouse in Chester, VT. I have quite an extensive stash, but my pieces are getting smaller and smaller as I use them in quilts. Of all the books I own, I have made more quilts from civil war legacies I and II than any others. I need more Civil War fabrics! These colors and prints speak to me, love the history and color tones. They truly add a ‘homey’ look to beautiful quilts. My stash of reproductions needs thinnning. I just can’t resist collecting beautiful new fabrics. I just love the look of antique quilts. My Civil War fabric stash needs a kick start. Would love to start making these quilts in light of the recent movement to remove CW statues. History is history. It cannot be erased. We can only learn from our mistakes. A kick start-I don’t have any yet. The quilts displayed are beautiful, but very labor intensive. A few more colors, I do need to go shopping…. this looks like a great book…. thanks for a chance to win. Small quilts have become my passion. After being diagnosed with Rheumatoid Arthritis, it became increasingly difficult to manage the larger quilts. After twelve hand surgeries, I considered selling my machines and equipment and giving up. Then, I discovered miniature quilts and a whole new world opened for me. My Civil War fabric stash needs….. more brown and gold fabric. I definitely need some more colors and prints. I love Civil War fabrics and can’t wait to get this book. Civil War books and fabrics are my quilting passion. If they had taught history in high school using quilts I would have aced every class. LOL I love reading the stories about the Civil War and am very, very sad about what everyone went through. I would love to add this wonderful book to my collection for more inspiration. I always need and want to shop for more reproduction fabrics, in fact, that is where two of my friends and I are headed Friday! My stash needs some thinning, I’ve amassed a lot. This book would be perfect to get started doing that. Love all the sweet quilt patterns. My stash could use a thinning. I have collected reproduction fabrics for a long time. I have some civil war fabrics including a stack of fat quarters so need this book for inspiration to start using them! Beautiful quilts! I definitely need more civil war prints…can you ever have enough? I need to go shopping for a few more colors and designs! HaHa! I love your books Carol and appreciate the detail and work that you put into each quilt within them! I am still in the collecting phase with my Civil War prints and feel like a kid in a candy store when I find a shop that carries them. It’s like discovering quilting and all the joy it brought 20+ years ago. Civil War patterns, books and fabrics bring me so much joy! My Civil War fabrics stash could use some thinning and this book would be perfect! Thanks for such an awesome giveaway and I really hope I win! My stash is overflowing the shelves and the room. I could always use more border prints and shirtings. I do need to thin it out, but when I try I find too much good stuff. My Civil War fabric stash needs a kick start—I don’t have any yet! I am in love with any of the reproductions fabrics as the come alive in my small quilts. I need to go shopping for more fabrics! I’ve amassed a lot and what’s wrong with that? I must admit my stash needs thinning – but to make that happen I probably need to purchase some more shirtings and other background type fabrics. A few more colors and prints would be helpful-my stash is moderate. Normally I lean toward bright colors in other fabrics, but there is just something about Civil War era fabrics that draws me to them. When fabric shopping, a few Civil War fabrics usually find their way into my basket. I need a kickstart-I don’t have any yet! I’ve amassed alot of civil war fabric- but sadly hate to cut it up yet. Maybe a good book like Civil War Legacies will spur me on! My stash needs some thinning and I love small quilts. Like Carol I tend to get tired of making the same block many times to finish a large quilt. I love the soft colors and the antique look of the reproduction fabrics as well so her quilts are perfect for me. I already own several of her books and patterns! I like to do scrappy quilts, so I have a pretty good stash — but there are always some colors that are under represented, such as purples. I am always on the lookout for a few great prints in the right colors to round out the assortment! A kick start! I keep looking at and loving the soft colors and beautiful quilts made with reproduction fabrics. This book would be a delightful start on a new journey! I just need to get busy using up my stash. I love the darker muddy colors of Civil War fabrics. The book looks like lots of sewing fun projects. Looks like another wonderful book from Carol! I’ve been re-organizing my sewing space and my stash definitely needs thinning–lol! I need to do a little more shopping. I have a few civil war prints but not many. the quilt store I go to has many civil war prints. This book really inspires me to use my Civil War /reproduction prints. However, I think I need to go shopping for a few more. Our Spring Shop Hop would be a perfect time to do that. I need to go shopping – I only have a handful of Civil War fabrics , even though I always love and admire the quilts I see using these fabrics. My stash of civil war fabric is small. I need to go shopping!!! I look at Book I and love the birds on the front, same with II and III and now — with IV — I need some to do the house stuff so I only can sew on Carol’s beautiful quilts!! Carol’s designs include some beautiful blocks! Her work is so inspiring. I have civil war fabrics in my stash but not enough to pull for a quilt. I need to go shopping! Thank you for the sweet giveaway! Some thinning — but then again, I might need to go shopping for some new fabrics that complement the old! I have some but can ALWAYS use more!! My Civil War fabric stash definitely needs a kick start! I have some but would need more for a quilt. I thought my stash needed thinning but during the storm days I sorted and organized. Now there’s room for more! My stash has a lot of reproduction fabric, but I can always use more. Love Carol Hopkins books. Maybe a little thinning…but those fabrics are timeless. My Civil War stash needs to be enlarged. I have just purchased fabric for one quilt and I know there are more in my future. A kick start but in my defense it’s really hrd to find these fbrics in Germany. I love the fabrics but so far do not have a lot of them. Will add them along though. oh how wonderful. I made a civil war quilt for my son and daughter in law, who do civil war reenacting, for their wedding. They love it and it is on their bed. My stash definitely needs a kick start! A few more colors and prints. I need to go shopping! This book looks great. 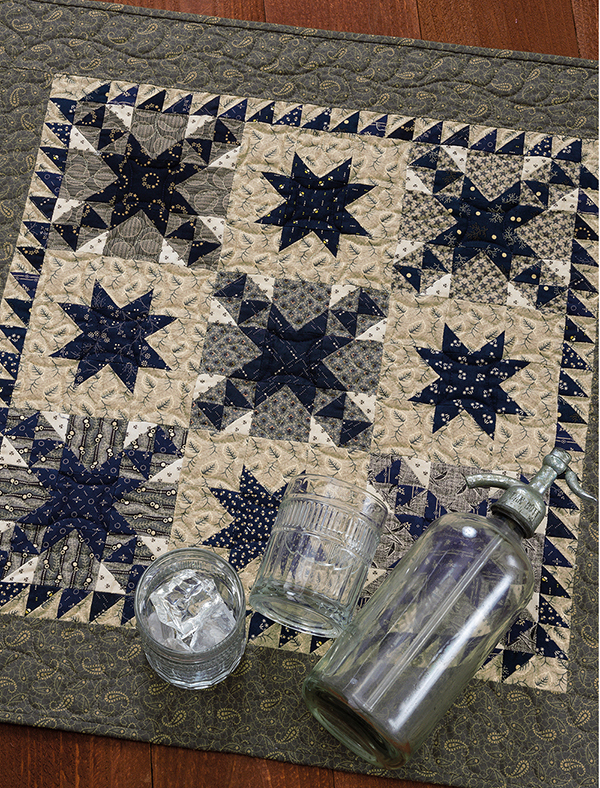 I don’t have any Civil War fabrics, but I love the blues and grays, and all of her quilts provide a springboard of ideas for many other colours. I am absolutely in love with Civil War fabric. I have tons but don’t want to thin my stash. I just want to keep amassing it. BTW, love her series of books. My CW stash definitely needs thinning … my quilting hasn’t kept up with my collecting! Would love to have Carol’s new book to get me going again! I have some Civil War reproduction fabrics in my stash, but I definitely need to go shopping! I think I might have a few Civil War reproduction fabrics. However, my stash really needs a good kick start to to actually make a reproduction quilt. The book looks quite interesting. I love civil war, have been collecting for quite awhile. There is something so appealing to me about old and legacy. Would be great to win this book to start on my bin of civil war. I don’t have any of those fabrics. Love the acid green! I’m a lover of these fabrics but so have none. This book looks amazing and would be a wonderful addition to my collection…maybe would kick start me to search out some fabrics and get busy on a quilt…thanks for the chance to win. I LOVE Civil War Fabrics and can never part with a scrap! By far my favorite line of fabrics. I have lots of FQs of Civil War fabric to use in quilts but will need to add some yardage to make larger quilts. Carol uses. The idea of making small quilts allows you to quickly have the joy of finishing a quilt. Then you can display a new quilt for others to see. Definitely a kick start is what I need! Love looking at all the Civil War quilts just have never had the fabrics to make one…maybe this is the year and I know with your book I would have great inspiration! I really need to do some thinning. I love the civil war fabrics. I love Reproduction fabric, the colors are beautiful. Shopping for new fabric is a treat,I need to add to my stash. I see little quilts in my future. My Civil War fabric stash needs A kick start—I don’t have any yet! I love the history behind these patterns. I need a few of more some colors; more yellows, greens, and purples. I love Civil War fabrics and quilts. I need a few more Civil War fabrics. I need to go shopping! Definitely some thinning. I have a huge stash but, I haven’t used them in years. I will NEVER turn down a chance to add to my Civil War collection!! There are, however, a few pieces that I look at and say, "What was I thinking?!?" I am collecting-I confess I am a fabric collector! I have a bunch of pinks and browns that need a few other colors and neutrals. I would love to have a few patterns to drool over while collecting! I love the civil war fabrics and quilts. They catch my eye every time. Could always use some more of those fabrics. Guess I’ll need to go shopping! I have amassed lots of strips and leftover squares. 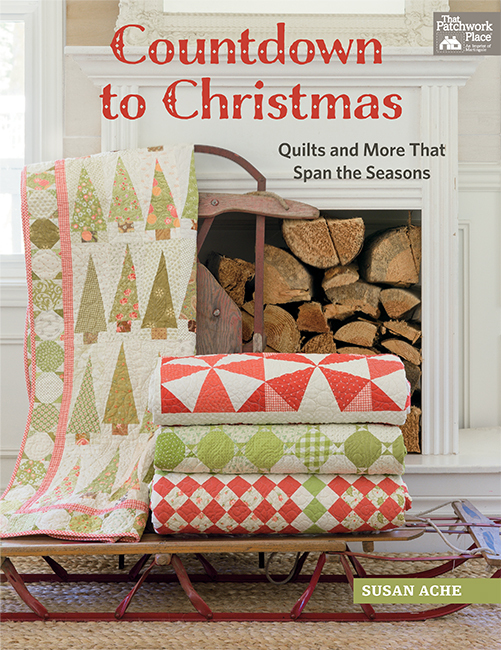 What fun it would be to do some of the quilts in this new book. I have some civil war prints in my stash, but need to go shopping. I don’t seem to have a knack for putting this category of fabrics together in a pleasing combination. I have only a small stash of CW fabrics so I need to go shopping for more! The book looks great, Carol. I only have one large bin of Civil War prints. I could shop for more! I have enough for a few tops but love the pinks and haven’t got too many of those. A few more colors and prints–I need to go shopping. I don’t know how I can have too many of these beautiful fabrics! A kick start! Love Civil War quilts and fabrics. I love Carol’s quilts. I recently started collecting civil war fabrics, so I need a to go shopping. I would love to have this book. I don’t have many civil war fabrics. I need to go shopping! A kick start because I really don’t have any yet. I like this book, though, so maybe it’s time! I love my books by Carol, so I am really excited to see this new one. I would be thrilled to win! Thank you. My Civil War fabric stash needs me to pull fabrics and get to work ! I have a 4 foot shelf fairly full of them, separated from the rest of my stash because they are special ! I am drawn to these for many of the same reasons Carol listed and agree wholeheartedly that small quilts are a delightful way to showcase them without the time-sink of making a full size bed quilt. I certainly have many bed size quilt projects in the works, but squeezing in a "little quilt" here and there does help one feel more productive! Thanks for the opportunity to comment, your book looks superb. I love the new book, good luck everyone. A few more colors and prints—I need to go shopping. This book would be great inspiration for that shopping trip! A kick start. I love the colours and patterns and they are always calling me when I am in a quilt shop. Love Love Love Reproduction Prints! Can never have enough!! Can’t wait to go shopping and add a few more. I made my first civil war about 2 years ago. Loved the design process. I’m building a nice stash–but there’s always room for more! A few more colors and prints! I need to go SHOPPING!!!! thanks!!!! I have only a few greens and a few reds from Civil War reproductions ~ used them in a Christmas project. Would love to build a Civil War stash: will probably settle for buying Civil War style fabrics just to make a tribute quilt for my great-great-grandfather’s service during the Civil War. It needs a kick start! and start collecting for my stash. My Civil War stash needs some thinning. There is a lot of beautiful fabric that needs to come out and play. This book looks like it will do the trick. I need a bit more education on what makes a print a Civil War print and what doesn’t. I’ve tried to buy fabs here and there (for the stash) that I thought fit the criteria, but I’m not sure. I’d love to own the book and learn! My Civil War fabric stash needs some thinning – I’ve amassed a lot and need to start using it up! Thanks for the chance to win a copy of "Civil War Legacies IV"! I have a smallish stash of Civil War fabrics. Maybe enough to make a few of these small quilts. I need to make some small quilts to thin out my stash. My Civil War fabric stash needs: A kick start—I don’t have much. I did buy the Mourning Grays for 1 specific project but don’t by reproduction fabric usually. If I was being honest I would say my stash could use a little thinning. However, can you ever have too much cheddar? I have made at least one quilt out of each of the previous books and hopefully our Guild is going to choose one of the patterns out of the first book for our Raffle Quilt this year. Fingers Crossed as that means I can donate fabric. Can’t wait to try another mini! This would be a great way to use up some of the reproduction fabric I have been collecting. I see many projects in my future from this book. My Civil War stash needs a few more colors – so shopping is needed. I have the first 3 of these books and I just LOVE them! This 4th one looks amazing and I hope I get picked to win it! Needs some thinning! Really must work on that this year…..
Definitely needs some thinning. I have a whole closetful and love them all. I need to go shopping. I have been using mine a lot lately! I love Carols quilts and I have all three of her Civil War Legacies books and I would love her lV book. I love the reproduction fabrics but I need a few more colors and prints so I can start making some of her quilts. So I need to go shopping soon. Thank you for the chance to win. Good luck everyone. Wow what a lovely book! If I’m lucky enough to be chosen that means more fabric shopping =new exciting project ! I definitely have holes in my reproduction collection. I love indigo blues and have many but use them the most. The biggest need, is for more rich mossy greens. This book looks fabulous! A few more colors and prints—I need to go shopping! Wow! What a great book! I have a large stash of civil war fabrics that are waiting for just the right patterns. I can use a few more colors and prints. I need to go shopping, but the book would help me to choose what fabrics I should get! Thanks for having this offer! I feel that I have lots of reproduction civil war fabrics, BUT I have no plans for thinning them out. They are all precious to me, and I hope to utilize them in the near future. I have very few Civil War reproduction fabrics. Every time my husband sees a quilt using these fabrics he comments on how much he like them. I guess I need to start building my stash!!! A few more colors and prints—I need to go shopping. Actually, I need many more! My stash has grown because I am making a Dear Jane Quilt with each block and triangle using a different fabric. I keep adding as I have great books to make more quilts. I don’t have much of a reproduction stash, but would love to increase it and work on the Quilts in this book! Mine needs thinning. I have been making some of the more "modern" quilts, but I love Civil War fabric so much that I just keep buying. Time to go back to my true passion. A few more colors and prints—I need to go shopping. Is there anything more fun than fabric shopping? I think not. Thanks for the chance. A few more colors…I need to go shopping! This book looks like it would be fun! Lots of thinning! I’ve collected yards and yards and love making scrappy quilts. A few more colors and prints, I need to go shopping. I don’t own any, and I find myself more and more attracted to it. I love Civil War fabrics, but need to add to my stash. The quilts in this book are beautiful, I would love to win! Of course, some people may think my civil war stash needs some thinning, but they don’t know anything. I am quite happy with the stash that I have and if anything, it could use some adding to. A few more colors and prints…you can never have enough! I have quite a stash, but it never seems like I have what I want. So….. I guess I must need more!!!! Love the book, can’t wait to get it! My civil war stash needs a few more colors, mainly purples and cheddars. Love the little quilts shown. Thanks for the preview, learning more about Carol, and the chance to win. Looking forward to adding this book to my collection. I will be hitting local quilt stores to add some fabrics to make these adorable quilts. Love Carols patterns, have purchased previous ones. I have a nice stash of reproduction fabrics, would love to make some of these little quilts with them! Thanks for the giveaway chance. Think I need some thinning. This book might put me on the path putting some of it to good use. My Civil War stash needs a spectacular backing fabric for a Civil War quilt that I have planned for my son who is a Civil War enthusiast. I have been collecting fabrics with Civil War themes for a while. My. Civil War stash could use maybe a few more patterns. Using Carol’s books may just help get that stash out that has been growing and put it to good use on the sewing machine. My C/W shelf is short on a few colors: Blue, Black, Cheddar, & light shirting backgrounds. There is a quilt or 5 in this book I’d love to make, so I’ll be shopping….. I need a few more colors and small prints. Every time I see one of Carol’s books I need to go shopping and fill out my stash. I’m so excited to read that Carol has written another beautiful book for those of us that are hooked on Civil War reproduction fabrics! I have all three of her other volumes and find they are chock full of inspiration as well as beautiful photos and patterns. I’m in the process of making two Civil War Era, patterned quilts right now. One of which will be used by a friend who is an author of a book on the Underground Railroad in our area. As she researched her book she learned how quilts were an important part on the war on slavery so she asked me to make a sampler quilt to illustrate that point in her presentations. Carol’s books are nestled within my stash of Civil War reproduction fabrics, just waiting to be enjoyed. I’ll be delighted to add another one of her books to my treasured collection! I have lots of reproduction fabrics, but I love to add to my collection! I have had this book on my "i need" list since I first saw it featured-love! I definitely need to thin my stash. I sometimes have a panic attack when I see the material I have amassed. Heaven help me. I am falling in love with cheddar. I need to find some for my stash to make your quilt. My Civil War stash needs some thinning so that I can replace some of my favourite pieces without feeling too guilty. This lovely book certainly looks like it would help me to do this. I definitely need a kick start. I love civil war prints. I’m ready to start building up my stash again. I definitely need to add to mine. I have very little add the moment. I have a lot of fabric and the stash need some thining. I would love the book and get inspired. I definitely need a kick start! Since I make Quilts of Valor and quilts for sick or disadvantaged children I don’t have any Civil War fabric. 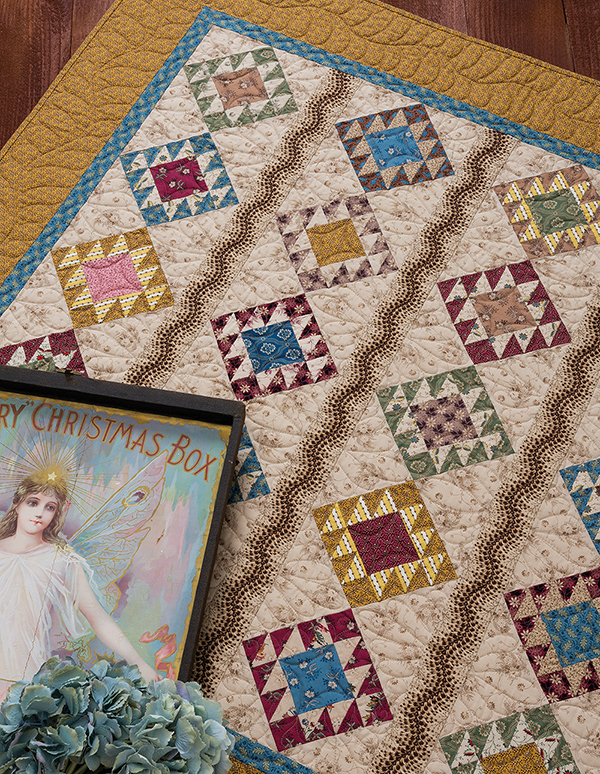 But I love the warm cozy colors, and there’s a quilt in this book that is definitely calling my name. It would be a real treat to win this book. Thank you for the opportunity! My stash could use more Civil War fabrics! Love Carol’s books! Love to win a copy of her new book. My favorite fabrics are civil war as well. Haven’t tried a little quilt yet so I think it’s time to try it out. Love the gold background. Is that available for purchase? Can’t wait to get my copy. A kick start—I don’t have any yet! I’d love a copy of this book! My collection is just starting– I need to shop, and I need to be kick-started on down the road! That said, what beautiful little quilts! I want! I could use a few more colors for my stash to make it complete. I could always use a few more colors to complete my stash. I love Civil War Legacies books. I have a large stash of fabric, so I would say that it would need some thinning and this book promises to help me do that. Thank you. I love civil war reproduction prints. I think it is because I love antique quilts. This is what I have been looking for to use my stash of reproduction fabrics. If I don’t win the book I will buy it. My stash contains a fairly large amt. of civil war fabrics. They are definitely my favorite and have never even thought of thinning the collection. It gives me a lot of satisfaction to be able to complete a quilt top from start to finish from just shopping from my stash. I feel fortunate that I am able to feed my passion with such beautiful choices. A Few more colors and prints – I need to go shopping. I tend to buy blues and reds – need to branch out and add some other colors. What a great book. You never have enough civil war fabrics and a book like this is the perfect inspiration needed to use them. Need a kick start. Wonderful book! Some thinning… I have amassed a lot but there is always room for more! I would be honored to own this book! I would like to add some more light shirtings as they seem to be needed in my stash of scraps. I need more Civil War repro fabrics. There is no store near me that carries them so I must shop for them online. I love the civil war Quilts, and really everything about that era. There’s no such thing as having too much civil war fabric. I need to go shopping. Would sure enjoy the book. My civil war fabric stash needs thinned ( by making another quilt of course!). Love Carols books. Can’t wait to see this one. I could use some more colors. I tend to collect brown, blue and cream prints/reproductions. I’m new to quilting at 58 yrs old and I hope carol’s book can teach an old dog new tricks. My Civil War stash needs some thinning out as I have amassed quite a collection of fabrics over the years. There are too many small pieces that are favorites and hard to part with. Those bits would be perfect in a small quilt! Love all of Carol Hopkins books. I am just a civil war quilt lover. Would love to win this book. My stash needs a good kickstart. I just recently found some beautiful civil war fabrics that I love – so although my stash is a little out of control I feel like I need to go shopping! Carol’s books are inspiring. It has dwindled, need more fabric. I would have to say it needs a kick start—-and, I need to go shopping. My stash could use a few more colors and prints—I need to go shopping. I have really enjoyed the other books and would love to have #4! My Civil War fabric stash needs more prints and colors. Carol’s new book is filled with inspiration–thanks for featuring it!! I love adding fat packs to my Civil War stash; lots of eye candy and all of them can work together in Carol’s scrap quilts. I could always use a few more colors and prints, but I do have a good collection of civil war fat quarters! My Civil War fabric stash needs a few more colors and prints—I need to go shopping. ANY excuse to go shopping! I’d love to win the book, thanks for the chance to add it to my bookshelves. I could always use a few more colors and prints to use in Civil War patterns! I could use some more colors, civil war prints are getting hard to find around here. I love the history of the civil war. a few more colors! I’m planning a quilt with civil war colors. A walk to the shop is necessary. My Civil War fabric stash always needs some additions — because there are always so many new beautiful fabrics to choose from! And with new books like this one with so much eye candy, who doesn’t want to make each and every one? I always need to go shopping…. These are absolutely gorgeous quilts…. Love the book. But I need a few more colours. Need to go shopping. My Civil War stash needs to be used; so winning this book would be a huge help. I built up quite a collection over the years, needing a little more in my cheddar pile. Love her books, but I definitely need more fabrics and need to go shopping!! I really don’t have much for civil war prints. I love them but have been trying to use up the fabrics that I have so when I retire I can replinish my stash. I love the quilts from this book and I know the civil war fabrics will be making it into my sewing room. Thanks for the giveaway. I have 38 fat quarters of a fabric collection, but need to buy a few larger cuts for use as background and backing fabric. My Civil War stash needs some serious thinning, I really love the reproduction fabrics, but I have a hard time saying no to any fabric. I need to do some thinning–I have lots! Definitely need to use up some of what I have, but then, is there such a thing as having too much fabric????? Love the quilts in this book! I need a few more colours. Time to go shopping. I’ve been collecting Civil War fabrics for years and have quite a stash that needs thinning. Carol’s book would be perfect to help me to thin that stash. I enjoy making small quilts since they can be finished faster than the larger ones and are easy to display. A few more colors! I’m ready to shop for those accents to make my Civil War quilts sing. So many ideas and not enough time to try them all! I have a great collection started and I always looking for more to add. It is a good thing I don’t have to choose a favorite fabric. I love them all. Thanks for a new book to enjoy. Well, I really should be thinning it down and using it up but the little devil on my shoulder keeps telling me I need more colors and prints. I’ve been saving fabrics for a very long time but have not started a Civil War quilt. this would kick start me for sure. I LOVE this series. I started with one small basket of repro prints to make one small quilt, and I haven’t looked back, I keep seeing more fabrics and more designs to make. I always want more, new colors and prints. I have a pretty good collection of Civil War era prints but I could use more lights. Need to make more acquisitions! 1980 was the year I learned to quilt also. Civil War era has always been my favorite; I LOVE the designs and colors. Love the small quilts in your book. I have some fat quarters of the civil war reproductions and would love to have your book. I have some Civil War fabrics, but not a lot. I have a tendency to go for brighter colors, but still like the look of period. Thanks for the draw. The majority of my stash fits this category, but you can NEVER have too much! I don’t have much civil war reproduction fabric in my stash. I tend to "oooh and ahhhh" over the quilts I’ve seen made with them, so it must be a sign that I need to make one (or more) for myself!! My civil war fabrics need a lot more company. Don’t have near enough. I don’t think I could ever have too much civil war fabrics. That is always where I gravitate in a quilt shop! Some always ends up going home with me. Love Carol’s books, the mini quilts are gorgeous. Some thining I’ve amast a lot! But I love it! What a great book to use to work on that! I need to start thinning my repos by using them. They are hard to find in my area, so I order online or buy in Lancaster. Probably have some colors that I need to purchase. Have the Civil War 2 book. Love the photos in #4 and would love to win. I "need" this book to keep my collection current. Have made many from the other books, and love a number of little quilts in this new one. My civil war fabric needs thinning for sure. That is my primary type of fabric and I love all the ideas shown in your book! I definitely need several more colors, especially when I see another version of beautiful Legacy Quilts. Carol makes me want to go right to the store to complete my fabric collection. I love the Civil War fabrics but I do need a kick start. My Civil War stash is pretty small. My civil war stash definitely needs more fabrics—would love this book! I need to go shopping – I have some Civil Wat repro fabrics but need to expand the colors. At least that’s what I tell myself! My Civil War fabric stash needs a kick start–I don’t have any yet! My Civil War stash is … non-existent I’m afraid. I odn’t know why that is, since I’ve always loved them! I definitely need a kickstart! I only have less than a yard! Thanks for the inspiration and a chance to win! These are such beautiful quilts from a timeless era! My Civil War stash could use some thinning! This book would be very helpful! My stash has plenty of blues and other colors but still short on browns and "proper" reds.. Need to reduce my stash by sewing a quilt ! Really want to see how a finished one will look. Thank you. Mine could use some thinning, but a few extra stripes wouldn’t hurt. Looks like another wonderful book, I’d love to have it! I wouldn’t say I really need more fabrics, but I always enjoy looking for a few more. I need to find that pattern that really challenges me to say, "yes! I really want to start working on that!" More colors and prints!! Thank yoy for this opportunity! Love, love, love these fabrics. I think it needs thinning, but I’m not sure which ones to thin! I need a plan. Perhaps there are a few in this book? I’m in!